There are massive amounts of misinformation that circulate around the Internet when it comes to what you should be feeding man’s best friend. This is troublesome, because everyone knows what it is like to love a dog, and no one who has felt that bond would want to cause their canine companion any inadvertent health issues. Yet, this is exactly what can happen if you follow some of the pseudo-scientific advice that is floating around the Internet. 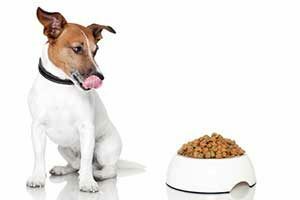 Today, we’re aiming to dispel dog nutrition myths. In the process, the hope is that a picture will be provided that makes it much more clear exactly what should, and shouldn’t, be going in Fido’s bowl. This can’t be stated loudly enough. If you find a high quality veterinarian who gets to know your pet and understands their dietary requirements, you should trust their advice. 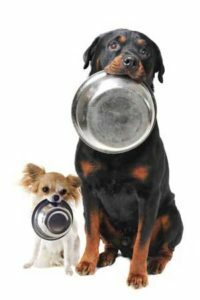 Just like in humans, if your pet has a specific health condition such as a weight problem, diabetes or an allergy, it may be vital to feed them a highly specific type of food. In this case, take your vet’s recommendation and feed your pet the right type of diet for their condition. Organic is one of the terms that is applied to both human and pet foods and yet is very poorly understood. First of all, the jury is still out as to the health benefits of eating organic in any population, but when it comes to pet food, the waters are even muddier. This is because there is no official legislation that governs exactly what does or does not qualify as organic pet food. There are a variety of existing organizations that may or may not provide a certification that companies can place on their products, but it is important to recognize that anyone can slap a label that says ‘organic’ on their pet food. Because there is no regulation of this term in the industry, a package that says organic is no guarantee that the food is really organic by the definitions of the term that are applied to foods fit for human consumption. On top of that, there isn’t any solid scientific evidence to show that dog food based on organic ingredients would provide any health benefits for your pet. This is a myth perpetuated by companies who enjoy charging their customers a lot more money for dog foods that don’t contain these more affordable ingredients. Oddly enough, there is no real scientific backing that suggests that grains and corn are in any way harmful to your dog. Often this myth centers around the concept of allergies. There is a certain amount of circuitous justification for this. A dog can absolutely be allergic to corn, or to any of the grains that might be used in pet food. What you’re not often told however, is that there is just as much of a chance that your pooch is allergic to any of the meats used in dog food. Allergies can also crop up towards any of the other innumerable ingredients that often end up being used by pet food companies – it is not something corn and grains have a monopoly on. This is a myth that dog food companies are always happy to sell you, because it means more money in their pockets. There is a large marketing trend used by these companies to convince potential customers that the more they pay for a given dog food, the better it is for their pets. There is an entire industry of ‘premium’ pet foods that has cropped up, where customers may pay 50% or more on top of the regular price of pet food. This would be acceptable to some people if they were truly getting a product with increased nutritional or health properties. However, that isn’t the case. While some premium brands may be very healthy dog foods, there is certainly no category of ‘premium’ pet food that is better than all the rest. Price is no indication of quality, and the only way to be sure if a given brand is good for your dog is to just read the ingredient label. There are a number of people putting forward the view that you should try and feed your pet ‘raw’ or ‘natural’ food only. There is a certain appealing logic that your dog would want to eat the food that it’s ancestors would have eaten in the wild when they were running free on the plains. However, evolution has changed our furry friends a great deal since those days, and the domesticated house dog of today is not ideally suited for a raw diet. First of all, raw foods and meats may contain a number of pathogens in the forms of parasites and bacteria that could be very harmful to your pet. Because most of our pets haven’t had ongoing exposure to these particular pathogens, they may have had not opportunity to build up any immunity to them. As a result, a raw diet can actually make your pet sick. Couple that with the hazards posed by bones and you’ll see why you might want to think twice about this type of diet. Finally, it is important to note that dogs that are brought up on pet food don’t have a high supply of the enzymes needed to happily digest raw meat. A little treat of meat won’t hurt them from time to time, but the switch to a raw meat diet could cause serious gastrointestinal distress. Meal is one of those dirty words that people think is harmful for your pet, but the reality couldn’t’ be further from the truth. Meat meal still comes from a high quality protein source and is processed with the same attention to detail that is used when making pet foods that are based on ‘meat’. The protein quality is the same regardless of the source, and there is no reason to think there are any health detriments that will occur from feeding meat meal. Most pets are pretty rugged eaters. Unless otherwise identified by your vet, they typically don’t need a specialized diet that is formulated for their age or any of the many various goals of speciality dog foods. For instance, when you see products marketed to improve a dog’s coat or a similar goal, there is very little evidence that most of these products are actually healthier for your pet. The best advice we can give you when it comes to dog food is to remember that the pet food companies are in the industry to make money. Like any other company that is pursuing their own agenda, you need to process all of their marketing information with a careful filter. You’ll notice a trend in many of these myths that are frequently employed by pet food companies. If a product makes high promises about the health benefits it offers your pets, especially if it is only offered at a premium price, it can pay to be skeptical. Save your money and buy a healthy, nutritious dog food brand at a reasonable price, and spend the money you’ve saved on buying your dog a new toy instead.